During the community day partners and ACEs presented best practices and customer success stories. 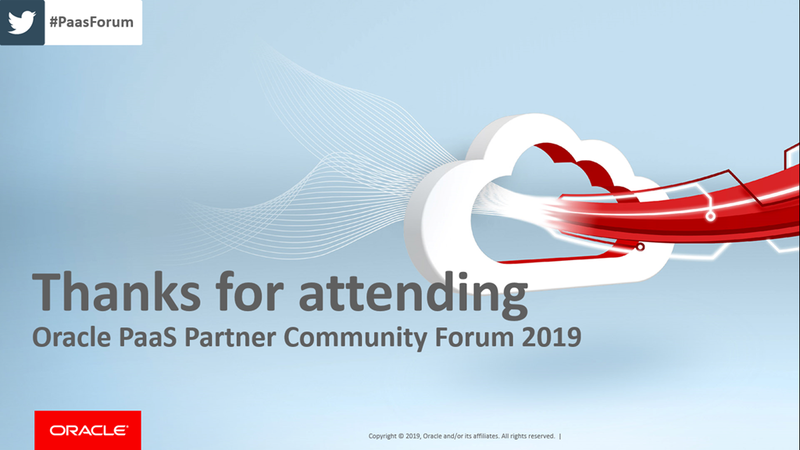 As part of the business & OPN track partners received the latest updates on cloud pricing, marketing services to promote your service offerings, and the WEDO showcases. As part of the keynote day Ed Zou and Martijn Vlek introduced the Oracle Cloud Platform including a blockchain and visual builder live demonstrations . The Oracle product management team updated you on the latest PaaS innovations like processes with embedded machine learning, digital assistant, content and experience cloud & virtual reality and APIs. Enterprise Process & Integration or Development tools & DevOps or Application Development or an Innovation track. For SaaS partners we offer a virtual Innovate, Extend and Integrate SaaS tack. We will keep our tradition to wrap up the conference with the legendary ACE demo – special thanks to Lucas Jellema and team! Within the last two days you had the opportunity to attend hands-on trainings different hands-on trainings take place. A two days integrate, innovate and Extend SaaS workshop. A two days Hackathon to build a rapid prototype. Or 12 different half day labs, you can build your own agenda by choosing each session.